If you’re like most people, you’re busier than ever and it’s becoming even more of a challenge than it used to be to connect with those you love, especially your intimate partner. Many people have a challenge connecting with each other on a daily basis. 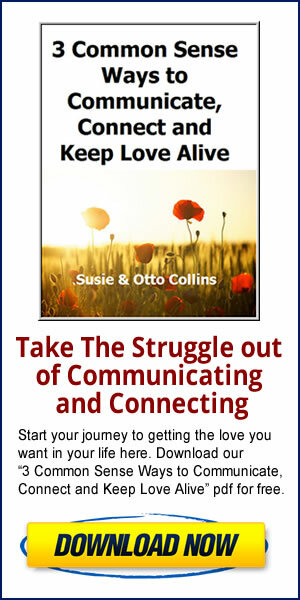 We’ve discovered that making some kind of positive connection on a daily basis is part of the glue that holds two people together and keeps passion alive over the years–as well as builds trust. We realized that there are some very simple things they can do to connect with each other that take only moments…but the results can be very powerful and significant even if you’re the only one doing them. 1. Look in each other’s eyes. After working with many couples, we realized that looking in the eyes of your loved one can be a challenge when you’re not used to doing it or when lots of thinking gets in the way. What sounds so simple may not be so. If this is the way it is for you and you want to connect deeper, start small and don’t be discouraged if it feels awkward at first. The next time you pass your loved one in the hallway, look into his or her eyes for just a few seconds. And then practice increasing the time you hold eye contact. It’s like any skill–making eye contact just takes practice. Why do we “forget” or never learn how to make eye contact especially with those we love? For whatever reason, making eye contact might feel too vulnerable and revealing, especially when you have a lot of thinking around it and what it means. Not making eye contact can be one way we protect ourselves and put up a shield so we won’t be hurt. This shield might not have anything to do with your current partner–but it may. So if you have some trust issues coming up as you experiment with making eye contact, check out our “Relationship Trust Turnaround” course. Over the years, we’ve seen how profoundly things can change for the better when two people touched each other when there wasn’t an agenda. One way to start doing this is to just take a moment and sit next to your partner while you’re watching tv. Allow some touching. Put your hand on your partner’s heart and your partner puts his or her hand on yours–and then just breathe for a few breaths. It might feel peaceful, relaxing and connecting when you do this or it might feel awkward. If it feels awkward, don’t give up but just keep moving toward one another in small ways. One step toward making touch easier and more connecting is remembering that you have choice and allowing yourself to make the choice to reach out in a simple way, with non-invasive touch. Maybe you start with a hand or foot massage. Whatever feels good to you, we invite you to start touching more to create a deeper connection of the heart. Remember, it only takes a moment to convey love and caring. Okay, so we know that complete honesty can open up a can of worms that can certainly cause separation and disconnection. What we’re talking about are the little omissions and “white lies” that either one of you tell or don’t tell on a regular basis that really aren’t a big deal. But the truth is that they ARE a big deal. 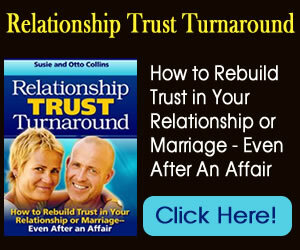 Trust is eroded which can take its toll on the relationship over time. Telling the whole truth takes only a few moments and can mean all the difference in your relationship. It can mean the difference between whether trust is the foundation of your relationship–or it isn’t. It only takes a few moments of time to do any of these acts and can make so much difference in your relationship. What we’ve learned it’s not necessarily the big stuff that happens but rather what happens moment by moment. Take advantage of every moment you have to connect with your loved ones. If you do, you’ll see a difference in the quality of your life and love.